I have not been blogging much lately due to be very busy at work and other things. 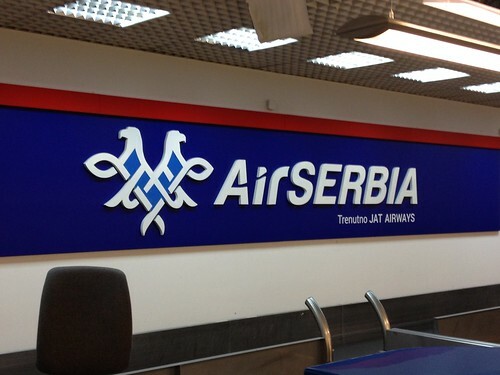 Recently I saw the new desk at the Nikola Tesla Airport of Air Serbia. JAT (Jugoslav Airlines Transport) recently sold 49% of the airlines to Etihad Airlines, the national carrier of the United Arab Emirates. JAT was 100% owned by the Serbian government and had debts of 170 million Euros. Another problem is market size. There are too many regional airlines in the Balkans as each small country has their own carrier. The market is just not big enough to support so many different airlines. I like the new logo. The double eagle is homage to the Serbian Orthodox crest, and the lines below look somewhat like Arabic script. I am looking forward to flying on the new Airbus A 319, “Novak Đoković” and wish Etihad and the Serbian Government best wishes for profitability!